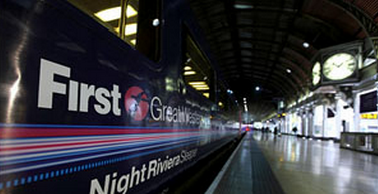 THE vital London to Penzance "sleeper" train service is safe for at least 15 years, the Government has confirmed. Rail Minister Theresa Villiers has allayed fears the overnight service would be scrapped by revealing it will be included in the new Great Western franchise. It comes after a visit to Looe in South East Cornwall this week where Ms Villiers backed calls from Plymouth leaders for better rail services to the city from London, as reported in The Herald. Campaigners feared a repeat of controversy in 2006 when the "night riviera" service narrowly escaped the axe. Ms Villiers acknowledged the sleeper is vital to business commuters, spending a full working day in the capital. She said: "I am delighted to be able to announce that the Paddington to Penzance sleeper service will be included in the new franchise agreements. "I know how important the sleeper is for the economy of Cornwall and Devon, a point made strongly to me by local MPs." Whichever company secures the Great Western deal after it expires next year will have to lay on a sleeper even if it is loss-making. Westcountry MPs lobbied ministers to press the case to preserve the service after indications in a consultation document that its future was at risk. The link is one of only two sleepers in the UK and stops at most mainline stations in the region. Leaving the capital at 11.45pm, the train, which includes one and two-bed compartments, arrives in Plymouth at 4.02am and Penzance at 7.53am. In the other direction, it gets into Paddington before 5.30am. After train operator First exercised a break clause in the contract, the franchise will be put out to tender this year with the new operator taking charge of services throughout the South West from April. The sleeper commitment represents the first demand the Government will make of bidders when it tenders the 15-year contract.